Prepare brownie mix per box directions for 8x8 inch pan. Watch during last 5 minutes of baking; do not overbake. Cool completely. Cut into 9 equal squares. Drizzle caramel sauce in zig-zag pattern on plate, if desired. Place one brownie square in center of plate. Add caramel to top of brownie. Cut a second brownie square into cubes. Place cubes randomly on full brownie to look like a mountain. Starting at top of brownie heap, drizzle chocolate sauce or ganache glaze. Allow chocolate to run down the sides and pool slightly at the bottom. Top with whipped topping or whipped cream, if desired. Chocolate Ganache: Add 1 cup of high-quality chocolate (I use Dove milk chocolate squares) and 3/4 cup cream to a sauce pan. Heat on low, stirring, until smooth and creamy. Cool slightly and use on brownies, ice cream or other desserts. This is a rich dessert! Cut portion sizes down if desired. Calling all brownie fans! 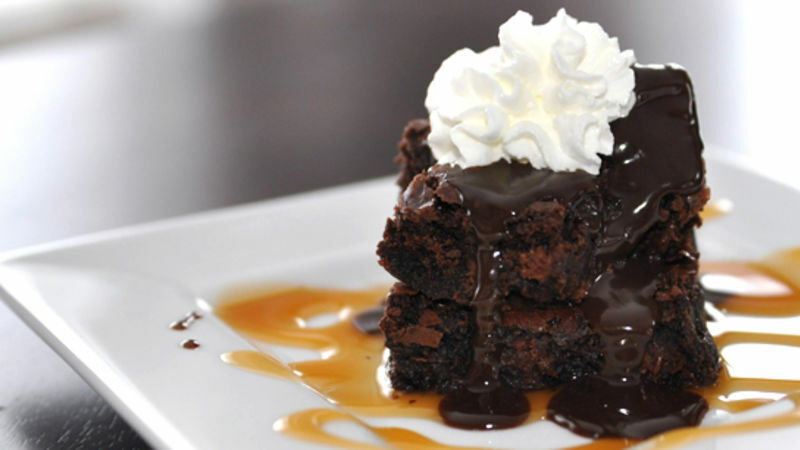 This Chocolate Lava Mountain Dessert is a chocolate lover’s idea of a great time. Based on the idea of a chocolate lava cake, this super rich dessert features fudgy chocolate chunk brownies instead of chocolate cake as the base. It drips with molten chocolate ganache like a lava cake, but adds a gooey caramel center to sweeten the deal. Even my camera drooled when it took a peek at this chunk of chocolate heaven before it opened up wide and swallowed the scene.It was totally worth getting melted chocolate all over my camera so I could lick the spoon as I drizzled chocolate ganache (the fancy word for chocolate icing or glaze) down the sides of this unbelievably rich triple-chocolate dessert. I can't be the only one who needs physical restraint when I see this much chocolate on one plate. It goes without saying, that this is a rich dessert! Cut portion sizes down if desired. This restaurant-inspired chocolate confection is surprisingly fast and easy with a boxed brownie mix! Not kidding! And you can use purchased caramel sauce and chocolate sauce, too -- although I made easy chocolate ganache in just a couple minutes, and that put this dessert over the (mountain) top. Yes, chocolate makes bad days better, and good days great. Melted chocolate makes people stop in their tracks and gaze like deer in the headlights. You're staring at that picture, right?